Always on the search for geek culture colliding with food, we were told about Yogurtland’s newest summer promotion featuring Nintendo and just had to check it out! Yogurtland has taken classic characters like Mario, Luigi, Princess Peach, Yoshi and Bowser that star in popular Nintendo games and have adorned their walls, cups and collectible biodegradable spoons with them! 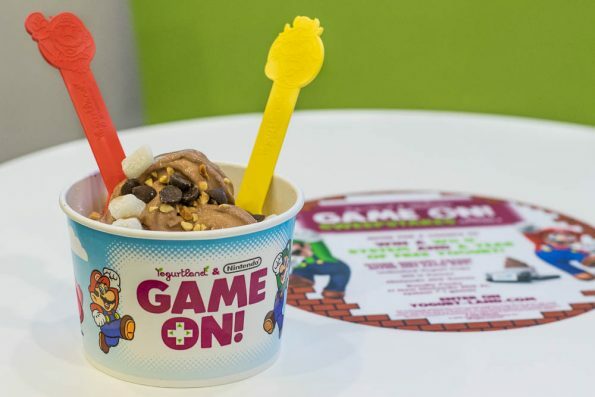 Yogurtland has even created some Nintendo-inspired flavors like Mario’s Chocolate Gelato, Luigi’s White Chocolate Pistachio and Toad’s Rocky Road. When we stopped by our local Yogurtland only a few of the flavors had been released (they release a new flavor just about weekly). We decided to try Toad’s Rocky Road. We topped our creation with peanuts, mochi, and dark chocolate chips! 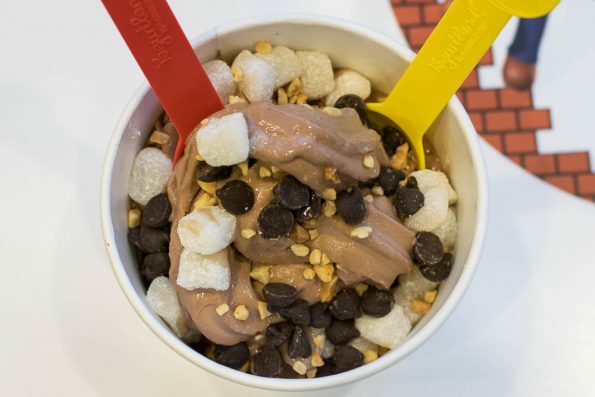 The addition of mochi instead of marshmallows gave this rich and delightful chocolate frozen yogurt a new punch. The Toad’s Rocky Road flavor itself was just the right balance of chocolate and sweet, not overly sweet mind you. We can’t wait to go back and try Shy Guy’s Pineapple Lime Coconut Sorbet and Koopa Troopa’s Lemon Cupcake (just to name a few). To expand the fun experience outside of the store, Yogurtland is also hosting a sweepstakes that offers the best treats summer has to offer. By visiting https://www.yogurt-land.com/, fans of Nintendo, Yogurtland and winning cool prizes can enter for a chance to win a Wii U system and one year of free frozen yogurt. Inspired by Yogurtland’s sweepstakes, we have decided to do an Instagram giveaway of our own! The rules are simple: 1) Make sure you’re following us on Instagram. 2) Take a photo of your best Yogurtland creation (hopefully with the Nintendo flavors, we are geeks after all). 3) Tag 2 friends who love frozen yogurt! Make sure to use the #GeekEats hash tag! The winner will get a $10 gift card to Yogurtland! The winner will be chosen on 7/29/16! Good luck everyone and we can’t wait to see your photos! *The Geeks were not compensated or given any comped items to facilitate the review segment of this write-up, Yogurt-Land product information and promotion details were provided by Yogurt-Land; All opinions are wholly our own. Gift cards were provided by Yogurt-Land for future visits and giveaway after information inquiry. View our Disclosure Policy for more info.